Kitty acts as both a character and a location in the Elementary universe. 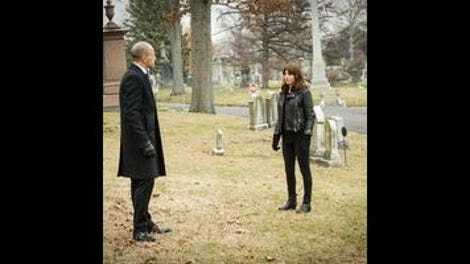 Her moving-target presence forces both Sherlock and Joan to recognize their positions relative to her, and to each other, in a way the other supporting characters on the show generally don’t (though Shinwell has come close). And those geographic assessments can lead to some telling moments. In this episode alone, Joan and Kitty confirm their friendship in the same prickly terms as always; Joan calls Kitty Sherlock’s friend (and the previouslies confirm Sherlock thought so, too), though Sherlock insists on the more detached “protégé”; and Sherlock apparently used to call Kitty the “anti-Watson,” which is about as revealing a beat as one could imagine from that particular tectonic shift. We know Sherlock has always had more blind faith in Kitty than Joan has. (Joan’s approach to Kitty was less confident but revealed a lot about what she thought healing entails.) But there are also some lingering questions. At what point did Sherlock accept that Kitty, and not Joan, was his great experiment rather than an ongoing colleague? What essential quality separates Kitty and Joan to him that he ever considered them diametric opposites? And the question “Wrong Side Of The Road” is apparently asking: How far apart can he and Kitty get before a breaking point? But a secondary thing this episode is asking is how to get us invested in a case again. 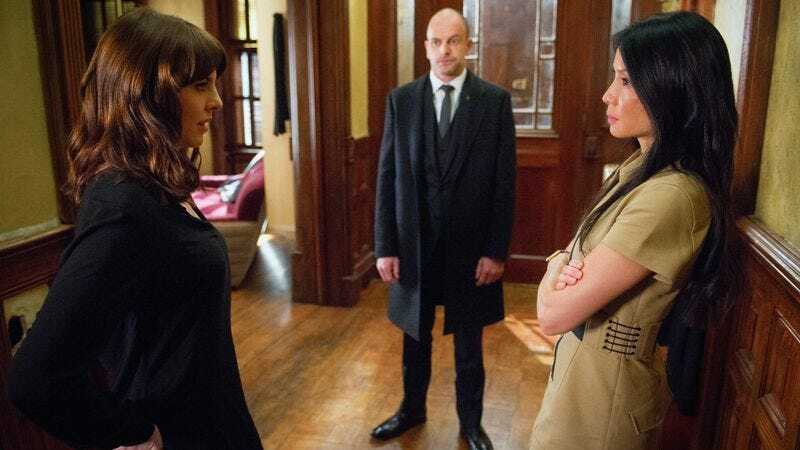 Elementary‘s procedural fatigue is fairly well established by now; it’s to the show’s credit that it’s tried to reinvigorate that angle by making things personal for Sherlock (and holding Joan captive again, I guess, though that fell far short of the mark), involving Shinwell as an ongoing source of extralegal tangles, and referencing the occasional Arthur Conan Doyle story. “Wrong Side Of The Road” is the first installment of a two-parter that seems determined to unite personal stakes, obligations to supporting characters, and canon nods. At this point, I’m not sure if the winks at the Red-Headed League are the spine of next week’s big reveal or just background noise, and since the most interesting twist came only a few minutes before the end of the episode, I assume the bulk of the canon payoff will have to wait until next time. Perhaps for now it’s best taken as a textual element in an episode that hinged so much on deflection and misunderstanding. Doyle’s “The Red-Headed League” is also the source of a line spoken by Elementary’s Sherlock in season one, describing Watson’s “love of all that is bizarre and outside the conventions and humdrum routine of everyday life” in a moment that shaped their partnership — and which Sherlock has used as a basis for willfully misunderstanding Watson ever since. We see it here when he deflects Joan’s concerns about Kitty (a detective should be tightly wound and Joan should apparently know that), but it’s far from the only feint here. Joan misunderstands Kitty’s motives for keeping herself at a remove, and shamelessly follows her to get answers; Kitty (potentially) misjudges Sherlock’s reaction to her intention to quit being a detective; Sherlock misinterprets Kitty’s restlessness and gets poleaxed by Archie, the new driving force in Kitty’s life and also the world’s most relaxed baby. But Kitty is a location, and Sherlock has already repositioned himself in relation to her. In particular, he moves from being a disinterested mentor and wastes no time pulling out the protective shield of his father’s social and financial privileges in order to confront the prime suspect. Jonny Lee Miller makes Sherlock’s discomfort palpable, but also shows the detective at his most dangerous. He’s only uncomfortable because he isn’t sure what answers he’ll get; none of those qualms are actually about leveraging the sort of advantages he purports to despise. Kitty’s pushed him to take up this particular mantle again—and deep down, if knowledge and moral upper hand won’t avail him with people in power, it turns out he knows his way around this corner of the map, and is just as happy to wield this sort of power instead. One suspects he’s only that calm about being arrested because Kitty’s at a safe distance (and, one hopes, because two of the best detectives ever made are on the case); we already know exactly what the Holmes name means when it comes to keeping Sherlock out of legal trouble. In the second half of this arc, I’ll be particularly interested to see how Joan and Kitty work together after Kitty’s time away, and Kitty’s vague plans to stop being an investigator. It can’t be a coincidence that Kitty’s blithe “We’re square” happens as Joan looks on with folded arms, and that folded arms later become an explicit marker of defensiveness—even of guilt. (Not for nothing, Cy Durning’s redheaded widow has her arms crossed at the beginning of her interview.) Joan clearly doesn’t begrudge Kitty her decision…right now. Their conversation about it is, as much as it can be, a discussion on neutral ground about a third point on their personal map that in that moment was far enough away to speak about. I suspect that given the cliffhanger, everyone’s positions have shifted. In particular, we don’t know how Sherlock’s arrest or Kitty’s determination to drop it all will look from their new positions. Will Sherlock try to protect Kitty and have it backfire? Will Kitty have to risk her child in a bid to protect her mentor? Will Joan get enough narrative space to feel the weight of being the connection between mentor and mentee? Is the episode title a hint that someone’s going to have to make some deep ethical choices? It would be great to have this two-partner two-parter pan out; there’s plenty of potential for some new geography. Joan and the shoelace is a nice investigative detail; I honestly couldn’t tell if it was subtle after the group infodump in the kitchen that skewed my expositionometer for the whole episode, but we’ll pretend it was. Certainly it’s the sort of detail that reminds us that Joan and Sherlock are operating with one another’s full confidence everywhere except where Kitty’s concerned. “Watson, you remember Kitty?” I get the sarcasm here, but I also feel like a show with the institutional amnesia of Elementary should perhaps avoid jokes about forgetting things wholesale. I have several sternly-worded questions about this handy letter that apparently cleared the air about a felony Gregson had to cover up. At least one of them is answered by Gregson cutting his eyes to Joan before agreeing to help Kitty. The promo materials for this two-parter trumpeted the “new man” in Kitty’s life, and I’m sure Rob and company thought that was a charming red herring, but I feel the same way about baby Archie the way I would have about a paramour: I am probably not going to care about people who exist only to raise stakes from the outside. This show has tried it many times; it is free to continue trying. Credit where credit is due, however; that is the most relaxed baby I’ve seen in a long time.